The Charlotte Hornets have agreed to send Dwight Howard to the Brooklyn Nets for center Timofey Mozgov, two future second-round picks and cash, league sources told ESPN. Parking Lot Chronicles moves from the parking deck to the valet as JaVale spends time with Karl-Anthony Towns, Josh Jackson, Justin Anderson, Andre Iguodala, Iman Shumpert, Timofey Mozgov & Warriors' security guy, Ralph. Donovan Mitchell leads the Jazz to a 114-106 win over the Nets with 26 points and 3 rebounds. D'Angelo Russell scores 21 points with nine assists as he leads the Nets to an upset victory over the Trail Blazers, 101-97. D'Angelo Russell throws an alley-oop to Timofey Mozgov and Mozgov finishes with a two-handed throwdown. Nikola Jokic sets a new career-high with 41 points as the Nuggets beat the Nets 112-104. Brooklyn's Tyler Zeller scored 21 points off the bench in the loss. Devin Booker stays hot with 32 points and 7 rebounds as the Suns defeat the Nets, 122-114. D'Angelo Russell scored 33 points for Brooklyn in the loss. Wilson Chandler puts up 26 points as all-five Nuggets starters get into double figures to beat the Nets 124-111. Spencer Dinwiddie scored 22 points off the bench for the Nets in the loss. Kristpas Porzingis scores 30 points and grabs 9 rebonds to lead the Knick to a win over the Nets, 107-86. Timofey Mozgov kicks it to DeAnglo Russell for the 3-pointer. Off the Rondae Hollis-Jefferson miss, Timofey Mozgov is there for the put-back layup. Spencer Dinwiddie scores 22 points as he comes up big late to give the Nets a 112-107 victory over the Cavaliers. D'Angelo Russell throws the assist through the five-hole of the defender to Timofey Mozgov for the slam. Aaron Gordon gets a double-double with 41 points and 12 rebounds to lead the Magic to a win over the Nets, 125-121. D'Angelo Russell passes between the legs of Nikola Vucevic to Timofey Mozgov for the layup. D'Angelo Russell scores 17 points and hands out six assists as the Nets withstand Nikola Vucevic's 41 points to beat the Magic, 126-121. Joel Embiid scores 22 points in just 15 minutes in his return to NBA action as the 76ers defeat the Nets 133-114. Jeremy Lin feeds Timofey Mozgov the ball deep in the post and Mozgov evades Joel Embiid on an up and under move for the layup plus a foul. D'Angelo Russell has a solid game with 16 points and 7 assists as the Nets cruise to a 117-83 victory over the Knicks. 2017-18 SEASON: Appeared in 31 games (13 starts) with Brooklyn, averaging 4.2 ppg. and 3.2 rpg. in 11.6 minpg. while shooting .559 (52-93) from the floor…As a starter, averaged 5.2 ppg. and 4.6 rpg. in 15.7 minpg….Led (or tied) the team in rebounding twice…Scored in double figures once - a season-high 11 points on Nov. 7 @ Denver…Pulled down a season-high 11 rebounds on Oct. 29 vs. Denver…Had 51 DNP-CDs. 2011-12: Appeared in 44 games (35 starts) with Denver, averaging 5.4 ppg. and 4.1 rpg. in 15.6 minpg., while shooting .526 (100-190) from the floor…Missed 10 games due to a sprained left ankle…Also played in seven playoff outings (five starts), averaging 4.0 ppg. and 3.3 rpg. in 14.1 minpg…. 2010-11: Played in a combined 45 games with both New York and Denver during his rookie campaign, averaging 3.6 ppg. and 2.7 rpg. in 11.6 minpg….In 34 games (14 starts) with the Knicks, averaged 4.0 ppg. and 3.1 rpg. in 13.5 minpg….Traded to Denver on Feb. 22…In 11 outings with the Nuggets, averaged 2.5 ppg. and 1.5 rpg. in 6.0 minpg….Scored in double figures twice and had 10+ rebounds twice…Recorded his first career double-double with 23 points and 14 rebounds on Jan. 30 vs. Detroit. CAREER TRANSACTIONS: Was not drafted by an NBA franchise…Signed as a free agent by New York (Jul. 13, 2010)…Traded by New York to Denver as part of a three-team trade, also involving Minnesota (Feb. 22, 2011)…Re-signed as a free agent by Denver (Jul. 27, 2013)…Traded by Denver along with a 2015 second round draft pick to Cleveland in exchange for a 2016 first round draft pick and a future first round draft pick (Jan. 7, 2015)…Signed as a free agent by the L.A. Lakers (Jul. 8, 2016)…Traded by the L.A. Lakers along with D’Angelo Russell to Brooklyn in exchange for Brook Lopez and a 2017 first round draft pick (Jun. 22, 2017)…Traded by Brooklyn along with the draft rights to Hamidou Diallo, a 2021 second round draft pick and cash considerations to Charlotte in exchange for Dwight Howard (Jul. 6, 2018)…Traded by Charlotte to Orlando as part of a three-team trade; Chicago traded Jerian Grant to Orlando; Orlando traded Bismack Biyombo and two future second round draft picks to Charlotte; Charlotte traded Julyan Stone to Chicago (Jul. 8, 2018). INTERNATIONAL CAREER: Played six seasons (2004-10) in the Russian Superleague, averaging 5.7 ppg. and 3.9 rpg. while shooting .501 (204-407) from the floor in a combined 133 games with LenVo, Samara and Khimki…Began playing professionally at the age of 18. 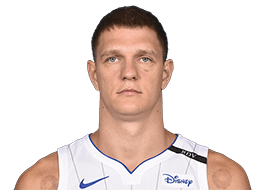 Full name is Timofey Pavlovich Mozgov…Name pronounced TEAM-oh-fay MOZ-gov…Born in St. Petersburg, Russia…Became the eighth Russian-born player in NBA history…A member of the Russian National Team…Helped Russia capture the bronze medal at the 2012 Olympic Games…He and his wife, Alla, have one son, Aleksey.